Daimler CEO Dieter Zetsche, with the company's latest autonomous vehicle in January, says during this decade there will be Mercedes-Benz cars with assistance programs that can take over driving on the highway -- first without the ability to pass, then with it -- as well as the ability to park the vehicle after the driver has exited. FRANKFURT (Reuters) -- Technology companies such as Google are unlikely to become mass car manufacturers, even if they have the potential to disrupt an industry increasingly focused on software and automated driving, the head of German carmaker Daimler said on Friday. In recent years, automakers and Silicon Valley companies have grown increasingly inter-dependent because next-generation cars need advanced software and sensors, shaking up the traditional pecking order among carmakers and their suppliers. 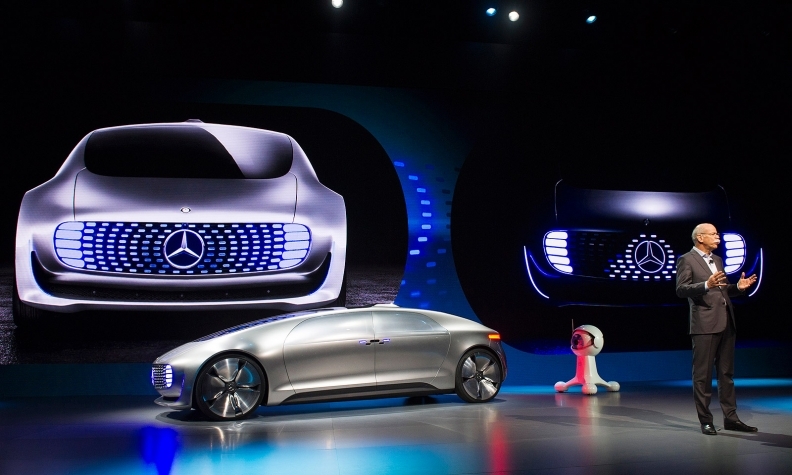 While Google unveiled an advanced self-driving car last year, Daimler CEO Dieter Zetsche said the U.S. company's objective was probably to better understand how cars are used, rather than to become a manufacturer in its own right. "Google and the likes want to get involved, I don't think in the first place to build vehicles," Zetsche told analysts, adding that Google was studying the home, the office and the car as places where people spend time. "We have to understand that, and then to find our roles, to which extent they are complementary, to which extent we become dependent, to which extent we are competitors," he added. Daimler and its Mercedes-Benz brand will put great emphasis on controlling data from self-driving and other cars. "When we talk about high safety with Mercedes, it does not apply specifically for protection from accidents, but this means safety of their personal data as well. To be able to provide that, we have to keep control, and we can't do that when it is collected by Google," Zetsche said.